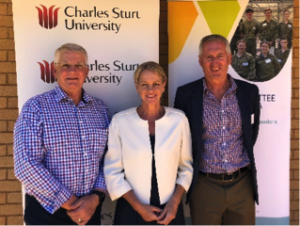 The C4W Wagga School Leaders Program (WSLP) was officially launched by C4W Chair, Michael Quirk and CEO Alan Johnston at the CSU AgriTech, Incubator Hub, on Thursday 21st February. A host of Dignitaries where in attendance for the launch, including CSU Strategic Adviser Regional Development the Hon Fiona Nash, Acting Head of Wagga Wagga Campus Aaron McDonnell, Hon Wes Fang MLC, Dan Hayes representing Wagga Wagga City Council, C4W board members Darren Nelson, Jason Wadley Colin Duff and Lyn Angel along with seventeen eager Year 11 students from 7 local High Schools completed Module 1 on the day. The first part of the day for the students involved introducing themselves to another student they didn’t know previously and learning some interesting facts about each other to share with the group a little later in the day. The students then had a briefing session on the purpose of the WSLP – Why is it important and Their role as Wagga’s future leaders/ambassadors. They also were given information on “Planning the Perfect Presentation”. During the official launch and morning tea, each student was assigned to interview a guest, the learnings from which were later discussed, with the student explaining what the best piece of advice the guest had given them regarding public speaking. Students where then given a presentation by Graham Walker from Estella Rise. Graham spoke of the importance of connecting communities, about leadership and explained in his experience “if you believe you can do it … do it! Emily Paul from the Catholic Education Office then commenced her presentation on the Leadership Shield. Emily assisted the students to grasp the purpose and design elements of a Leadership Shield. The creation of a Leadership Shield is intended to assist students to realise more about themselves, encouraging participants to think about who they are, where they fit in their family and what is important. Students were encouraged to learn more about their family’s story and history so their heritage could be better reflected within their Leadership Shields. The Shield and its key messages will be refined over the course of the program and framed for the students upon graduation. Nathon Irvin from TAFE NSW then presented a session on Media Presentation and tips. The students were given an overview on “what is media” and “where did it all start”, and how much it has changed particularly in the last 26 years. They were given reason to think about content in all forms of media, where it comes from, who is good at it. Valuable points for content when being interviewed are – What, where, why, who and how. Know what you want to get out of it. No more than 3 points, think about the message – who are you talking to, what do they care about and keep the message simple. The day was concluded with a debriefing, giving the students the opportunity to discuss and reflect on what they had learned during the day. Module 2 is scheduled for March 14, at the Army Recruit & Training Centre Kapooka. This module will cover – Me as a leader and member of the WSLP. We would also like to acknowledge Teys Australia & Hyne Timber who open their doors and share their operations, and those from both the public and private sectors who contribute their time to share their experiences within the program modules.